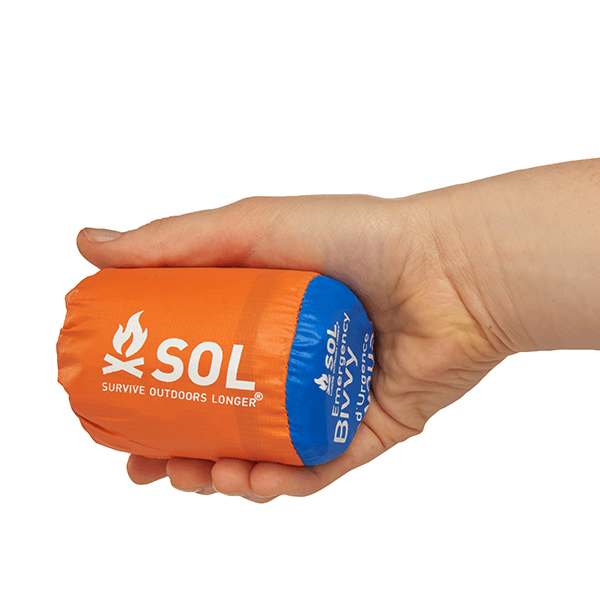 If you’re forced to spend an unexpected night outdoors, on the side of the road, or in your home without heat, count on the Survive Outdoors Longer®Emergency Bivvy to keep you warm and dry. 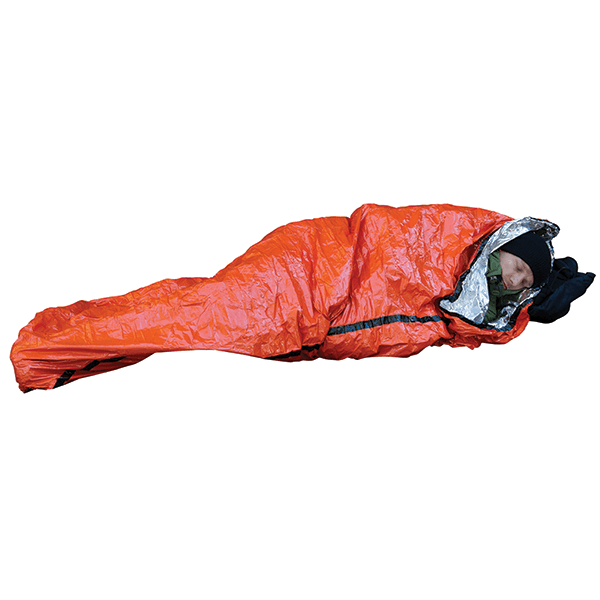 Made from tear-resistant, aluminum-coated polyethylene, this bivvy reflects 90% of your body heat back to you, providing life-saving warmth, and is sealed to protect you from wind, rain, and snow. 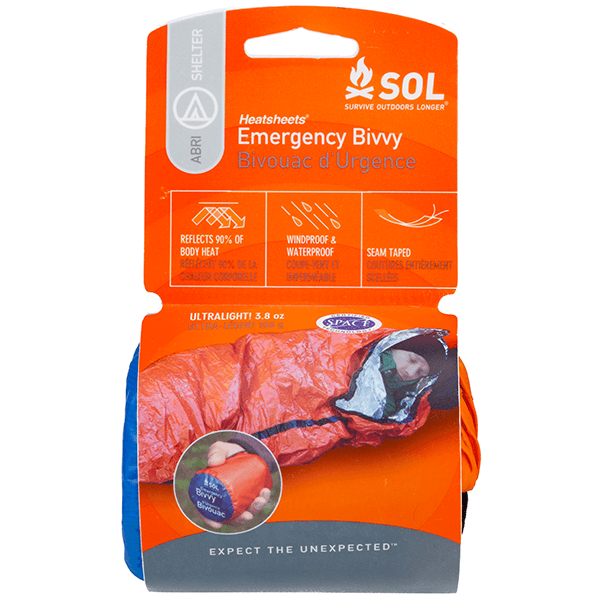 Ultralight and compact, the Emergency Bivvy is a small yet potentially life-saving addition to your survival gear, car, home, bike bag, hiking pack, and camping gear. 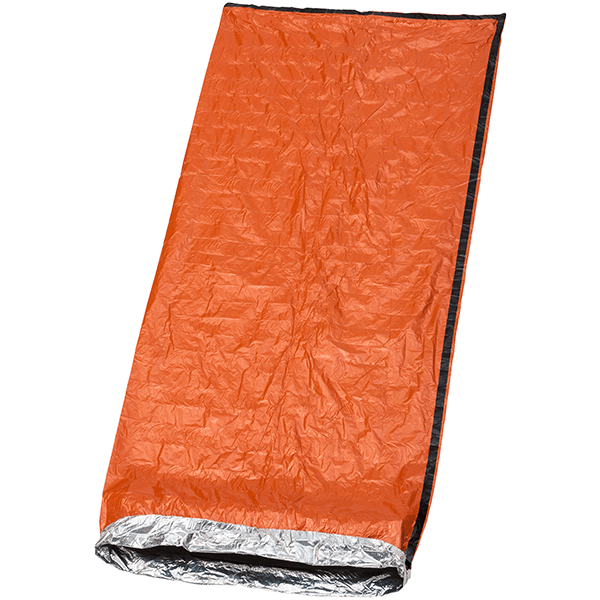 When turned inside out, the bivvy bag doubles as an emergency blanket, so you can wrap yourself in its heat reflective warmth while setting up camp, watching soccer games, or enjoying the stars. 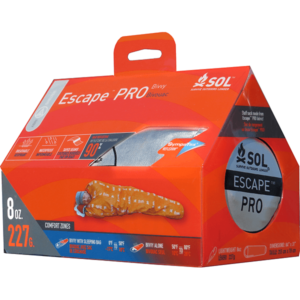 With this bivvy, you’ll have peace of mind knowing you’re prepared with the personal emergency shelter that has saved lives in the harshest outdoor conditions. 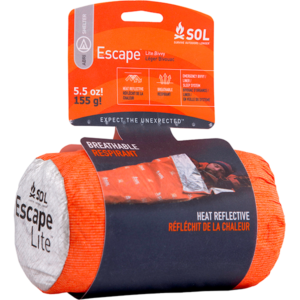 SKU: SOL0140-1138 Categories: Survival Essentials, Sleeping Bags, Tarps and Shade Shelters, Tent Floor Savers, Tents Brands: SOL Survive Outdoors Longer. 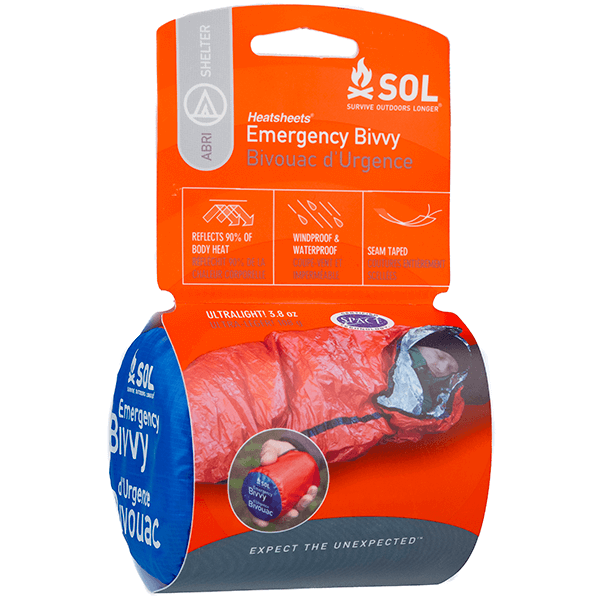 Get inside the bivvy like a sleeping bag for the unexpected night out or turn the bivvy inside out to use as an emergency blanket if you’re not ready to lay down. 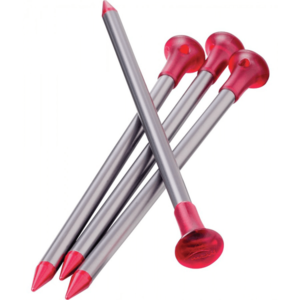 Stay warm in the fiercest conditions. 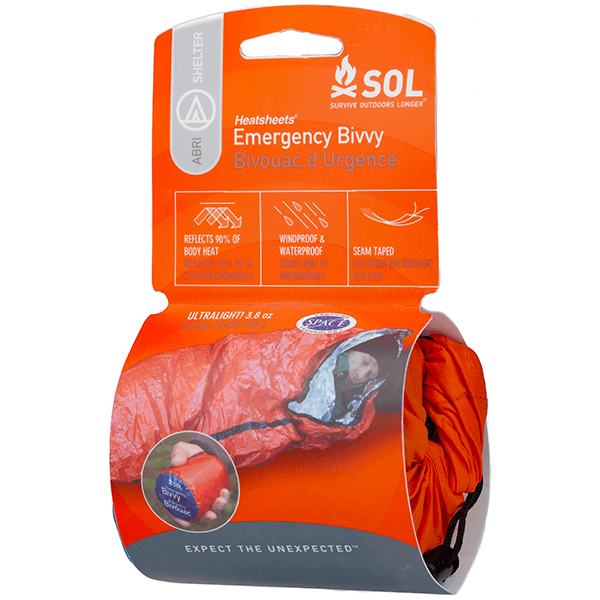 The Emergency Bivvy reflects 90% of your body heat back to you to prevent heat loss and trap warm air. 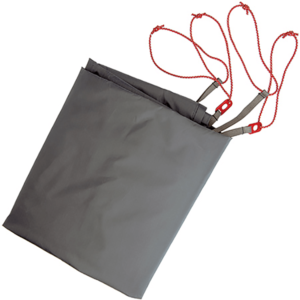 Take this compact bivvy bag camping, hiking, biking, or add it to your bug out bag for an emergency shelter you can rely on – it weighs a mere 3.5 oz. and is smaller than a 12 oz. soda can. Have confidence your shelter won’t let you down or cause undue stress. 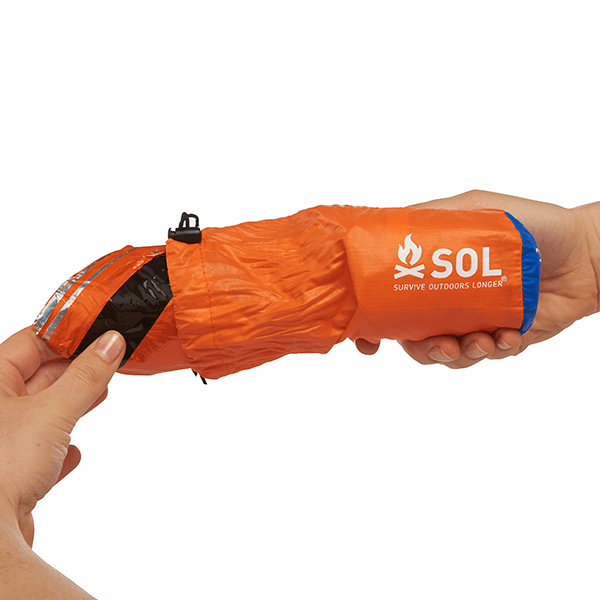 Unlike mylar or polyester, this bivvy features a quiet, tear-resistant material that won’t shred to pieces if punctured or fray your nerves by rattling loudly in the wind. Protect yourself from the elements. This waterproof bivvy has sealed seams and waterproof, windproof material to keep you dry and warm no matter what nature throws at you.